Members of Congress clashed Wednesday over continuing to provide money to Iraq as American troops complete their withdrawal by the end of next month. Rep. Dana Rohrabacher, R-California, portrayed the Iraqis as ungrateful for the American expenditure in lives and treasure. "We shouldn't spend a day more, a dollar more on their behalf," Rohrabacher said. Rep. Gary Ackerman, D-New York, predicted an imminent collapse of American support for more spending. "As the last of our troops leave Iraq next month, yes, next month, as the president promised and as our nation deserves, the interest of the United State Congress in Iraq will drop like in tree in an empty forest," Ackerman said. The Obama administration announced all troops would be leaving after the breakdown of talks with Iraq on whether thousands of U.S. forces should stay beyond the end-of-year deadline. At issue was immunity for the remaining troops, who could have been used both for training and security. 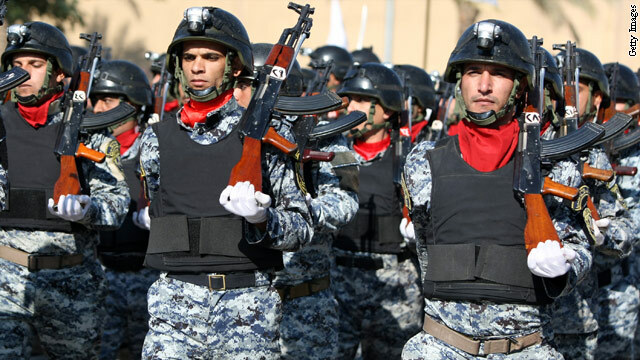 The lawmakers were speaking Wednesday at a House Foreign Affairs subcommittee hearing regarding an $887 million U.S. program to recruit and train Iraqi police, recently transferred to the State Department from the Pentagon. But the discussion widened to embrace the larger questions of U.S. policy toward Iraq, whether President Obama should have pushed harder to leave a contingent of U.S. troops beyond December 31 and what obligation America has to continue costly aid and development programs. "Iraq remains in a precarious position," said the subcommittee chairman, Rep. Steve Chabot, R-Ohio. "I believe there is much more we could have done to secure a limited troop presence beyond the end of the year." Fellow Republican Rohrabacher strongly disagreed. "I think when people look back they are going to wonder why the hell did we ever go into Iraq," he said. "There will be no question even in our minds today whether or not the money that was expended and the lives and blood we expended there was worth it. It was not." He added, "Whatever we are spending now should be terminated." Ackerman was critical of U.S. efforts to build a professional police force in Iraq. "The program objectives remain a mushy bowl of vague platitudes," he said. "There is no comprehensive and detailed plan for execution. There is no current assessment of Iraqi police force capability, and perhaps more tellingly, there are no outcome-based metrics. This is a flashing red warning light." Deputy Assistant Secretary of State Brooke Darby said the United States is making good on its commitment both to Americans at home and to Iraq by investing in and managing the police training program. "I take my responsibility for U.S. taxpayer dollars very, very seriously. I also take our mission in Iraq very seriously," she said. Ackerman asked her to set a date when the police training mission would be complete - "Eight years, four years?" Darby said she could not give a timetable. "The State Department does not underestimate the challenge of implementing this complex police assistance program in an environment that still presents great risk to our personnel," Darby had said in her opening statement to the subcommittee. In a lighter vein, Ackerman said the impasse in charting the future U.S. course in Iraq - and continuing programs without adequate review - reminds him of people delaying their departure from social occasions. "This is turning into what happens after a bar mitzvah or a Jewish wedding. It's called a Jewish goodbye. Everybody keeps saying goodbye but nobody leaves," said Ackerman, who is Jewish. The song "just went on. There were no other words," he said. "There has to be a time when we are no longer going to be there (in Iraq). ... And I don't know if $100 billion, if $900 million, if $800 zillion makes that time come faster or sooner." A watchdog over American spending in Iraq told the subcommittee that the State Department had tried to obstruct his investigation into spending on police training and embassy operations. Stuart Bowen, the Special Inspector General for Iraq Reconstruction, said he had to take the unprecedented step of sending "an obstruction letter" to the State Department to gain access to relevant officials and documents. "We heard today they (the State Department) are supportive, almost fully supportive, of our oversight at this stage and it took an obstruction letter, though, to break that logjam," Bowen said, calling it a legalistic argument over jurisdiction. Bowen, who said he has traveled to Iraq more than 30 times and just returned last week, had been investigating whether hundreds of millions of dollars in the State Department budget for training Iraqi police is instead being redirected to the operations of the U.S. Embassy in Baghdad and the protection of U.S. diplomatic personnel by thousands of private security contractors. He said the program suffered from a lack of oversight, no metrics or measurements of success and a failure to have Iraqi support. In his prepared statement to the subcommittee, Bowen quoted a senior Iraqi official, Senior Deputy Minister of Interior Adnan al-Asadi, as being skeptical of the program. "What tangible benefit is there to my ministry of 650,000 people who are in the midst of massive security challenges in the streets of Iraq? Very little," the report quoted the Iraqi official as saying. Bowen said the police program demands scrutiny. He raised concerns that only a small fraction of the money in the program is actually targeted for police, and that most will be spent on support costs, security, and operation of a helicopter air wing for the transportation and protection of American diplomats and staff. "This is the single largest program the United States is funding next year in Iraq," he said. "It is crucial for Congress to know the truth." I can't believe that I am in total agreement with a politician (Rohrabacher) but these arrogant self-centered conceited Iraqis have had it their way for far to long. Hitler would not have given them choices, yet during WWII they sided with the axis. They love their dictators. Look what Iran is doing to the British Embassy at the slightest drop of a hat. Don't fool yourselves they can and will do the same to us in a New York heartbeat. Why should we continue to give them the free ride when they are sitting on huge oil reserves and buying expensive jet fighters. Their economy is taking off while ours is sinking. They wanna play then they got to pay. No one rides for free. I commend the Congressman for aisnkg Iraq for our money back.However, I wish he would go to the banks and to our friends on Wall Street to ask for the same. The main difference is that the banks and Wall Street are now doing quite well. Let's recall when France came in to get rid of big bad England for us in the late 1700's. Should they have left an occupying force behind to make sure we established our country correctly? Should they have policed our people until they were satisfied our criminal justice system was adequate to the task? No. This was our country and we needed to handle things (right or wrong) and skin our own knees until we did. Sure, the England here is a vicious dictator who lived in their country, but the concept is the same. We did our job and we should go home so they can do theirs. Unless of course we want to admit that our presense in their country has other motives?